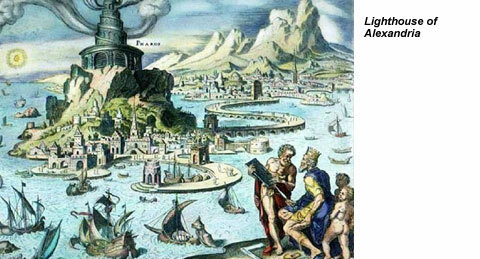 The Seven Wonders of the Ancient World is a commonly known list of seven remarkable constructions of classical antiquity. The list was compiled by ancient Greek historians and is thus confined to the most magnificent structures known to the ancient Greek world. It was based on guide-books popular among Hellenic (Greek) tourists and only includes works located around the Mediterranean rim. The number seven was chosen because the Greeks believed it to be magical. The great Pyramids of Giza are the oldest and most famous of the Seven Wonders of the World. The largest pyramid is 756 feet long on each side, 450 feet high and is composed of 2.5 million blocks of stone blocks that weight from 2 tons to over 70 tons. Some have suggested that the pyramid was never meant as a tomb, but as an astronomical observatory. Many believe in the theory that the great pyramid was the largest of a tradition of tombs used for the Pharaohs of Egypt. The Hanging Gardens of Babylon (present-day Iraq) rises on terraces some 400 feet above the level of the plain. These hanging gardens were built by Nebuchadnezzar II to console his queen, Amyitis who missed the mountains, trees and flowers of her native Media. Temple of Diana at Ephesus located in present-day Turkey measured 300 by 150 feet, with columns 60 feet high. This great Greek temple was dedicated to the goddess Diana Artemis, by Croesus, king of Lydia. Nothing remains of the original temple. 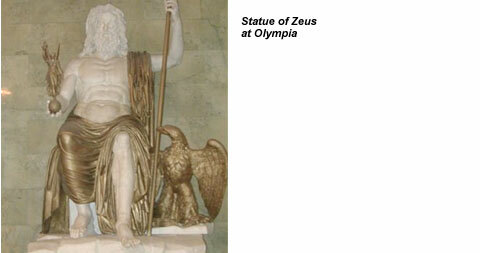 The Statue of Zeus, though small in relation to some of the other wonders of the ancient world, this statue of Zeus, sculpted by the Greek Phidias about 430 B.C., won fame because of its beauty. Zeus was carved from ivory then covered with gold plating and was seated on a magnificent throne of cedar wood, inlaid with ivory, gold, ebony, and precious stones. The seated statue occupied the whole meta-width of the aisle of the temple that was built to house standing 40 feet (12 meters) tall. 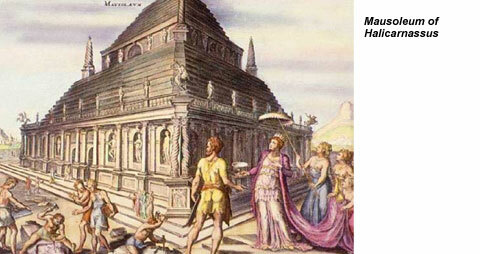 The Mausoleum of Halicarnassus was built by the wife of the Carian ruler Mausolus in 353 B. C, presently Bodrum, Turkey. This tomb was approximately 45-metres (135 feet) in meta-height and, adorned with friezes and several statues. Some of the sculptures survived and are today on display at the British Museum in London. These include fragment of statues and many slabs of the frieze showing the battle between the Greeks and the Amazons. 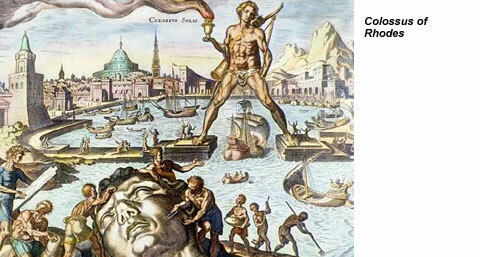 The Colossus of Rhodes was a giant statue of the Greek sun god Helios, erected on the Greek island of Rhodes by Chares of Lindos between 292 BC and 280 BC. The Pharos of Alexandria was a lighthouse built in 279 BC on the island of Pharos in Alexandria, Egypt by Sostratus of Cnidus for Ptolemy II to serve as that port's landmark, and later, a lighthouse. The lighthouse was over 400 feet high. It ceased operating and was largely destroyed as a result of two earthquakes in the 14th century AD. The remains of this imposing structure could still be seen in 1480, when the Sultan of Egypt, Qa'it Bay constructed a medieval fort on the exact site of the lighthouse utilizing some of the fallen stones.